“I hear that exact thing time and time again -- from people who grew up in the church and those who didn’t,” Weber said. But as much as humans love to complicate things, prayer is actually simple, he said. It’s just talking to God. 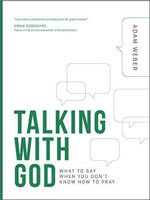 Weber offers practical advice about prayer in his new book, “Talking with God: What to Say When You Don’t Know How to Pray.” In recent years, his church, Embrace, has been the only United Methodist Church in the top 50 of Outreach magazine’s list of the 100 fastest-growing churches in the country. In 2016, the church’s fourth year in a row on the list, it was ranked 28th. Embrace was launched in 2006 and now has more than 4,000 members, meeting at five campuses and online. Weber has a B.A. from Augustana University, Sioux Falls, South Dakota, and an M.Div. from Asbury Seminary, Wilmore, Kentucky. He spoke recently with Faith & Leadership about Embrace and his new book on prayer. The following is an edited transcript. Q: Tell us about your church, Embrace Church. The first night we had 32 people. I was disappointed because I didn’t want anybody to come, hoping the dream would fall apart, but the other pastor was thrilled. I was going into my last year of seminary, 1,000 miles away, and he said his church would pay to fly me back once a month and have worship services. I didn’t have the courage to tell him no. So we started once-a-month worship. My wife and I moved back here in 2007, and in 2008, we went to weekly services. After three years, we had 100 people in worship and weren’t growing, and we thought about closing. But we went to morning services in September 2009, and we doubled in size. That’s when our growth began. The church is imperfect in every way, but I never thought I could love a church as much as I love Embrace. If you’re looking for our vision statement, it’s “Reach one more person for Jesus” -- tell them about the hope and joy and kindness and love found in the Lord. It’s really a commitment to do anything it takes to tell that one more person. We don’t take ourselves too seriously, but we take the Lord very seriously. I’m not afraid to laugh and share from the heart and be raw and real. One of my favorite things is that I don’t have to preach from a place of having everything figured out. Instead, I can share my brokenness and doubts and questions and point us to the one who has everything figured out, is all-knowing. We now have five physical campuses and an online campus. Most of our campuses are here in the Sioux Falls area, but we also have a campus up in Minneapolis. Q: To what extent does your book, “Talking with God,” grow out of your ministry at Embrace? And fast-forward to today. I’ve never needed prayer more. I’m sure the same will be true tomorrow. And then the very next thought I always have is that I can’t imagine going through life and feeling these feelings and not knowing that I can say them to God. So I guess my hope for the book is that it would encourage someone who doesn’t really know how to pray. I hear that exact thing time and time again -- from people who grew up in the church and those who didn’t. Humans love to make things complex. We take something simple and we make it complex, just for complexity’s sake. Prayer’s one of those things where as soon as you hit a certain age, you feel foolish for asking about it, because everybody knows how to pray, right? So obviously, everybody else knows how to pray, right? It’s almost like an acquaintance that you’ve hung out with time and again. After a certain point, it’s too late to ask what the person’s name is without its being awkward. Q: The book’s website says, “Prayer seems like it should be so simple. Yet, when it comes to actually praying, often it feels awkward and complicated.” Why is that? I know in my own life, I’ve never heard the audible voice of God. It’s awkward to say words and then not hear words back. There’s that initial uncertainty. And also, I don’t think the conversational aspect of prayer is something that many people have experienced. If someone says, “I don’t know how to pray; what should I do?” I always have two things that I come back to. First, whatever is inside of you, just say it. Whatever you feel inside of you, just say it. And second, instead of just saying it to yourself, say it to the Lord. Q: What else do you recommend? Don’t edit your words. Just say it. Close friends never doll up their words before saying them. Obviously, you shouldn’t say foolish things to anybody, but I’m able to speak from my heart with close friends and not worry about it. The same is true with God. Look at David. He did not think through a lot of his words. He just spoke from the heart with people, and the same thing with God. We have so much we can learn from kids about prayer. My kids never talk in a different voice or use fancy words when they’re praying. They say what is on their hearts. So often in our prayer life, we say what we think we should say instead of what’s actually on our hearts. Q: What’s the significance of prayer for Christian leadership? It’s critical. Jesus says, basically, “Apart from me, you can do nothing.” So Christian leaders, apart from him, can do nothing. On a practical level, prayer is important for leaders seeking God’s guidance. I share in the book about going through a season of burnout. If you’re doing anything substantial for the kingdom, it’s hard work. But going through that season, I realized that I’m not invincible. I’m not a robot. I’m a person with a soul who’s needy for Jesus in my life. Through prayer, Christian leaders connect ourselves to the one who is all-powerful. As leaders, we are fully dependent on him. We’re fully dependent on Christ for wisdom, insight, strength, kindness, joy. Q: What do you tell people when their prayers are not answered or are met only with silence? What do you do then? So in those moments, what happens when we cry out to God and it feels like he’s sleeping? The past seven years, my dad has had physical pain that has completely altered his life. He lays in bed from pain most of the day. I’ve never more faithfully prayed for someone to be healed than my dad. And yet one of the first things my dad will talk about is the goodness of God and the joy of the Lord. So what do we do with that? It would be easy to give trite answers, but ultimately, Jesus wasn’t sleeping because he didn’t care. So in the midst of those seasons where God is silent and maybe God appears to be sleeping, trust that he is good and his love endures forever. There’s a reason David kept saying that over and over, just trusting in God’s goodness and God’s faithfulness. I look back at my life, and there are so many things that I ask why about. Why did this happen? Why did that happen? Why this? Why that? I think everybody has that, and yet when I look back -- and this may seem to contradict what I just said -- God’s track record in my life is perfect. Even though things haven’t happened as I had hoped and wanted them to, there’s so much I don’t understand. Q: What do you pray for as a pastor of Embrace Church? I often feel like churches are lifeboats, and we throw out life jackets to people that are struggling to tread water. We get to toss out life jackets to people. A prayer that I would encourage pastors, leaders, followers of Jesus to say is, “God, how do you want to use me today?” That’s one of the coolest prayers we can pray. There’s so much joy in that, because it takes the focus off of ourselves, and many times that’s what prayer is.